It’s possible that you might not have heard the name Charita Jones but viewers of UK Kitchen Nightmares will certainly remember this characterful lady winning over the tough and abusive Gordon Ramsay – her food was never in question. Ms. Jones has another more familiar name – Momma Cherri. Soul in a Bowl presents the food that Charita knows best. These are classic Soul Food dishes with a few personal tweaks. They are both comforting and gutsy, but also economical. You might have heard about Soul Food but may never have had the chance to try it. There is nothing here that will require a trip to an ethnic supermarket, unless you are sufficiently enthused to buy Chitterlings (the only recipe in this book that will probably remain untested by me, although I might try some at Momma Cherri’s restaurant). Slavery was the root of this unique cuisine. Relying on vegetables, cheap cuts of meat and leftovers from the master’s kitchen, the enslaved population conjured and contrived tempting dishes that were hearty and sustaining but above all flavourful. You’ll want to start your Soulful adventure with Momma Cherri’s Cajun Seasoning. Lots of Charita’s recipes have a little of this spicy mix and you have the choice of buying commercial or using the mix described. There isn’t anything uncommon so I’d start by making a jar of this. It will keep for a month in a container or longer in the freezer. There are some classic dishes that will probably be the ones you’ll want to make first. Hush Puppies are fritters of sweetcorn and peppers; Cornbread (a staple but it’s refined enough to accompany meals other than the Soul variety), Southern-Fried Chicken, and Candied Sweet Potatoes all evoke memories of old films about Southern US states where the policeman was always ugly and nasty, and there was a fat white man sweating in a wrinkled suit …but the food always sounded good. Poor Man’s Pie is an original creation and I’ll be making it often. It’s a crowd-pleaser of a pie filled with minced beef, chorizo sausages and vegetables and topped with a cornbread batter. Sweet Potato Pie is simple to make, has a silky texture and would be a fitting end to a BBQ…or any event at all, in my opinion. Soul Food was born of necessity but has grown to be worthy and distinctive. 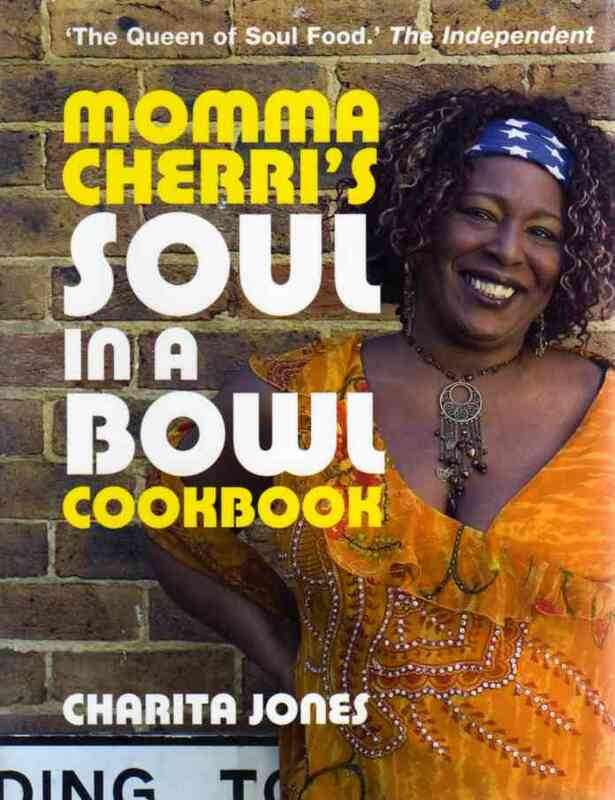 Momma Cherri’s Soul in a Bowl Cookbook allows us to enjoy amazing food that is truly something different. It’s accessible good food that will appeal to the whole family, and you can’t say that very often!